One of them is Pagekit, an outstanding new CMS developed by YOOtheme, a company that has been creating themes and extensions for Joomla and WordPress since 2007. Pagekit is a modular and lightweight CMS built with Vue.js and Symfony components. Its focus lies on being intuitive for end-users on the one hand and a modern codebase that provides powerful tools for developers on the other. Apart from menus, pages, and widgets, Pagekit features a powerful user and permission system as well as a blogging extension, including a sophisticated comment function. Since the release of its first Alpha version in 2014, Pagekit has been supported by a rapidly growing community on Github, so that in spring 2016 it finally leaves its beta phase and hits the screens. Pagekit’s simple user interface lets even beginners start their first website without any struggles. The administration is inspired by Google’s Material Design guidelines and provides a clean, intuitive and mobile-friendly experience for end users, featuring link and media pickers and a lot of one-click functionalities. 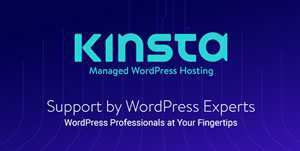 It is limited to the essentials without compromising features that CMS users have come to expect. 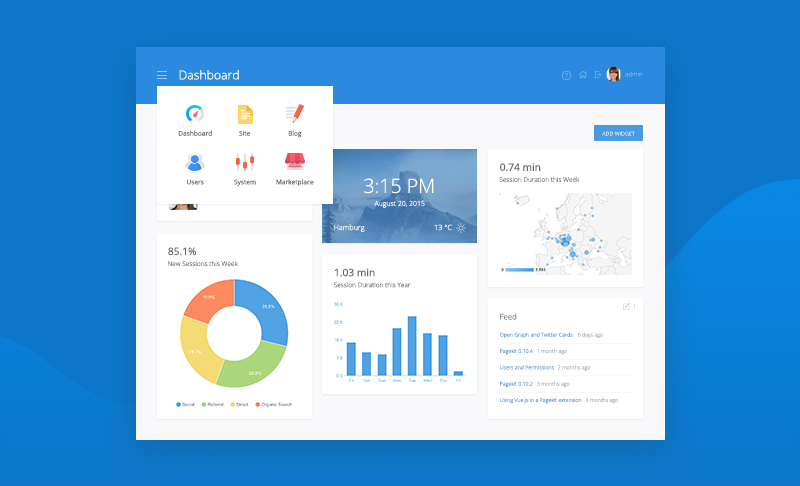 When logging into your Pagekit website, the first thing you’ll see is the Dashboard. It provides access to all areas of the administration and allows you to install useful widgets, like Google Analytics, to get an overview of your site’s activity and visitor data. The Dashboard leads you to the hierarchical Site Tree view. Here you can organize all your pages, menus, and widgets in a unified drag and drop interface. 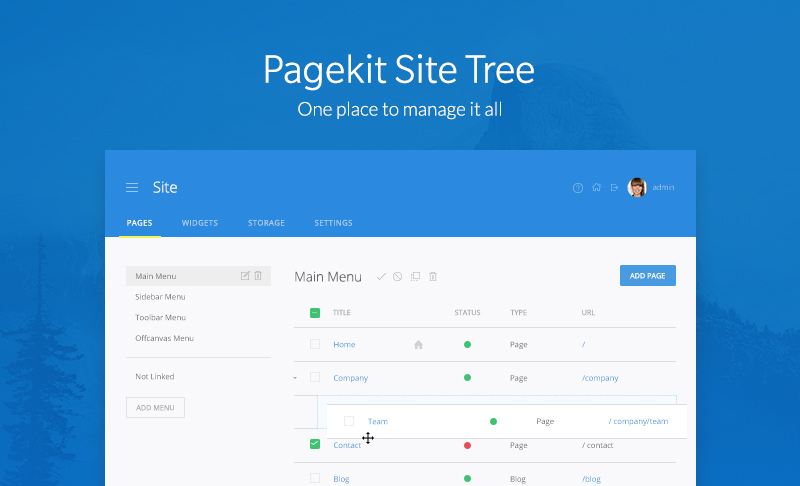 It is the central place to manage content in Pagekit and drastically simplifies creating websites. You can write the content of static pages, widgets and the built-in blog extension using a wonderful HTML & Markdown editor. It features syntax highlighting as well as real-time preview and has access to Pagekit’s file manager to upload media right into your content. 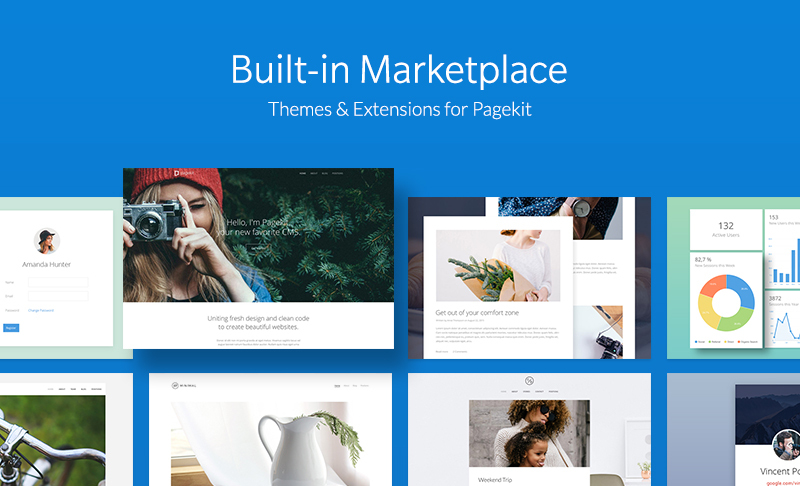 Pagekit features a built-in Marketplace. Users can install themes and extensions in one click without having to leave the administration area while developers have the chance to distribute their products to a global community. Since extensibility is one of the core ideas of Pagekit, its modular architecture makes it such a great base for interested developers. Right now, four official themes are at hand, including One, Pagekit’s default theme. The Marketplace also delivers a handful of in-house extensions: Google Analytics, a syntax highlighter, TinyMCE and the pre-bundled Blog. A number of third party themes and extensions are already available as well, for example, a form builder, a portfolio, and social media extensions. 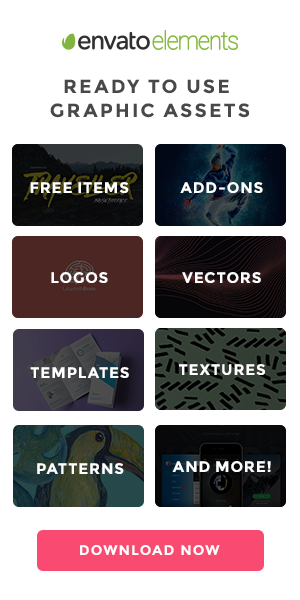 To help developers create their products, the Marketplace offers blueprints for themes and extensions. The idea is for the Marketplace to become a thriving theme and extension ecosystem. What looks good on the interface level, should also extend to a strong foundation. Since extensibility is one of the core ideas of Pagekit, the team explored what “modularity” really means. On the code level, nearly everything is a Module object: a theme, an extension, a widget and the core functionality itself. This keeps code complexity to a minimum, as developers can work with the same concept in many different places. Pagekit is extended through themes and extensions. They can make a small or big change to Pagekit’s functionality as well as make it look beautiful. The CMS manages them using the power of Composer. Install packages right from the browser, using the command line or by requiring them in your project definition. No need to distribute the package dependencies with your extensions. Pagekit will get and share the required libraries during the package’s installation. Pagekit is an open source project and published under MIT license. So if you want to get your hands dirty, head over to Github and take a look under Pagekit’s hood. Everyone is invited to contribute. 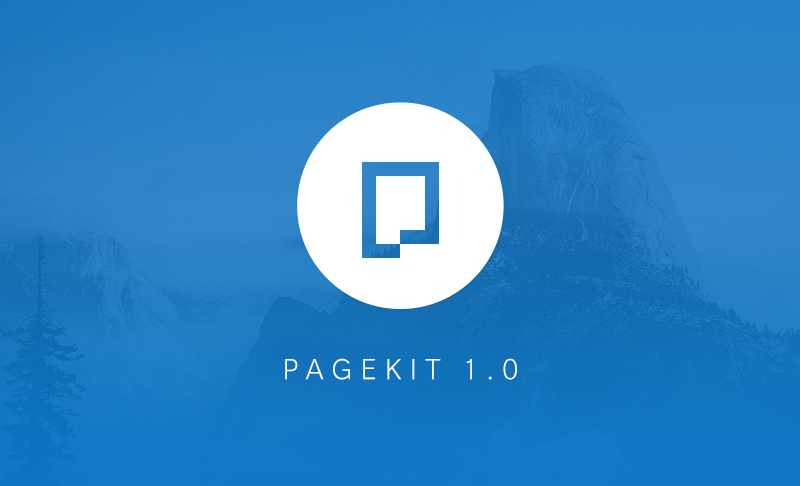 A number of useful resources are already available to help you find your way around Pagekit and even to start developing your themes and extensions. There are a lot of CMSes out there that suit different needs. But we suggest you give the new kid on the block a try. Its lightness, simplicity, and beautiful Material Deign user interface make working with Pagekit a true delight. It provides great tools for developers, and its modular architecture will make you itch to start creating cool extensions. We see a bright future ahead for Pagekit.